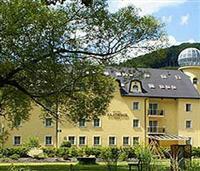 Ideally located in Hlubocky, in the gorgeous area of Hruba Voda, within 12 miles (20 km) of Olomouc, the 3-star Akademie Hotel offers comfortable accommodation in the Czech's Olomouc region. For pampering moments and sheer relaxation there is also a wellness centre with sauna, whirlpool and massages. Tennis court, volley ball and billiard are just a few of the superb facilities on offer, providing endless occasions for keeping fit and competitive fun. Get back to nature and revitalise your body. Outstanding cuisine is served at the hotel's restaurant, where a fine selection of menus is also available for functions, gala dinners and business luncheons. If you don't mind a drive you can reach Olomouc, the second oldest and largest historic town of the Czech Republic, also famous for its regular exhibitions. No visit would be complete without admiring important monuments including the Holy Trinity Column in Horni namesti, listed as a UNESCO monument. Official Rating provided by the Czech Association of Hotels and RestaurantsThe Czech Association of Hotels and Restaurants assigns an official star rating for hotels in Czech Republic. This Hotel property is rated as 3-stars.